Directions: From Denver take I-25 South to the Ridgegate Parkway exit, head west on Ridgegate Parkway and turn left onto Cabela Drive (right next to the huge Cabela's Store). Park at the end of the road at the trailhead. 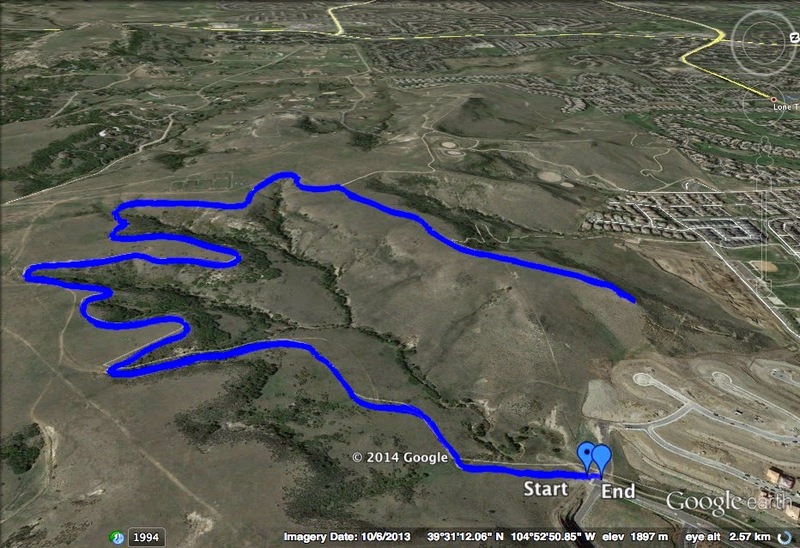 I found this hike when I was trying to hike Bluffs Regional Park but was too stubborn to look at a map. I saw a trailhead in the spot where I thought the park was, then saw a sign saying 2.67 miles to Bluffs Regional Park. Confused but not wanting to get back in the car, I explored this trail. It was a pleasant way to stretch my legs after a morning battling the crowds at Ikea, but nothing all that special. The viewpoint is interesting, has a nice stone seating area with a compass and map of the front range peaks and a good view of the Denver Tech Center. But otherwise the hike is unremarkable. In my opinion, Bluffs Regional Park offers a nicer hike with more of a buffer from the development of south Denver. That being said, if you are in the area and looking for a trail to hike, you could worse than the Lonehenge View Trail.